Spring brings our favorite days of riding â€” blossoming flowers, balmy breezes, and days that stretch on for just a little longer than the day before. But there's always the issue of what to wear. When you're heading out at daybreak the temperatures can be a bit jarring, and shady stretches of canyons can have a frosty wind that meets your knees with a sharp chill, but with the warm afternoons that follow you don't want to load up with full blown tights. 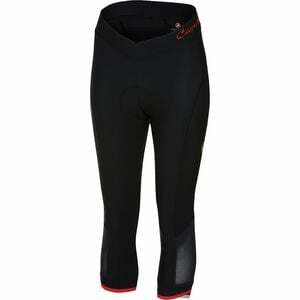 Castelli offers the perfect medium with the Women's Vista Knicker. Giving you a little extended coverage, but not so much that you'll be bogged down when the temps start to rise, the Vista Knicker offers pleasant support on your spring spins. Crafted from Castelli's new Pro Dry Soft 2-layer fabric, you'll find the knickers have a knack for wicking away sweat while you ride. The anatomic fit is supportive on your muscles, thanks to the strategic six-panel design. The legs feature a unique cross-wrap style hem, with a bit of elastic to help keep things in place when you're putting out big efforts, and a wide, yoga-style waistband keeps you comfortably supported up top. Speaking of support, Castelli employs the Women's Kiss Air chamois on the knickers, soaking up chatter from the road with multi-density foam, and a soft microfiber top brushes against your sensitive skin while wicking away moisture so you can stay comfortable for hours to come.